Palestinians in Ramallah welcomed the bodies of terrorists handed over to the Palestinian Authority by Israel on Thursday. 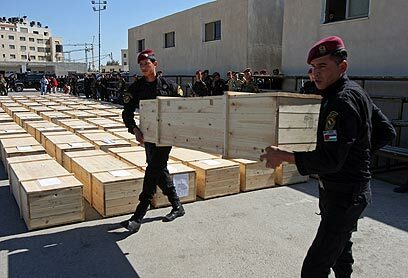 A total of 91 bodies were handed over in a gesture to President Mahmoud Abbas. Some 2,000 people, including the terrorists' family members, attended a ceremony in the Mukataa. The ceremony was attended by Palestinian leaders, including Abbas, as well as clerics headed by Jerusalem mufti Muhammad Hussein, who held a requiem. Among the guests were also Hamas members and prisoners released as part of the Shalit deal. The terrorists' relatives hailed the martyrs and members of Hamas' military wing. They also spoke out against Israel and cried "One million martyrs march to Jerusalem." "Until now, the martyrs were numbers to the Zionists and now they will revert to names of heroes," one Palestinian said. 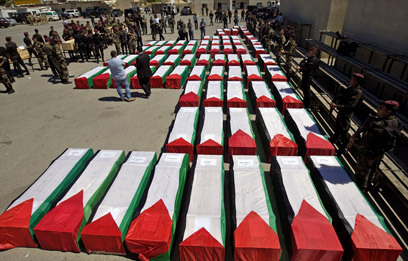 The terrorists' coffins were covered in Palestinian flags and placed in the Mukataa's central square. The seven terrorists who carried out the Savot Hotel attack in Tel Aviv in 1975 were given a special honor. 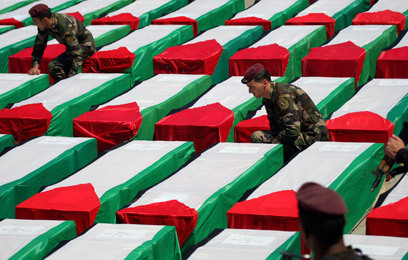 Each of the seven coffins was carried by six members of the presidential guard. Abbas laid a wreath on the coffins and volley shots were fired by the guards of honor. The bodies were then transported for burial by PA cars. The bodies of 79 terrorists were transferred to the PA via the Beit El crossing on Thursday morning. Later, a truck carrying the bodies of 12 other terrorists headed towards the Gaza Strip via the Erez Crossing where a military ceremony was held. The bodies were then taken to Gaza's Shifa hospital. A prayer service was later held at a Gaza mosque before the bodies were buried. Israel is set to transfer dozens of additional bodies to the PA in the coming weeks. See all talkbacks "Palestinians welcome terrorists' bodies"